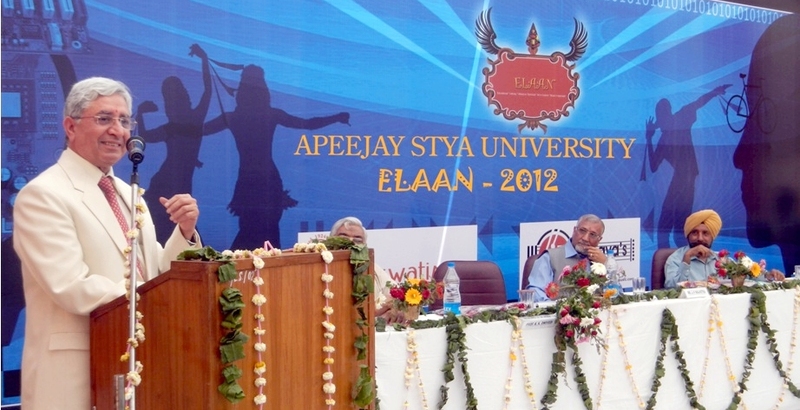 Apeejay Stya University along with Apeejay College of Engineering celebrated its first annual Techno-Cultural fest ‘Elaan 2012’ at its Sohna campus last week. This 3-day extravaganza took off with a gala inaugural function which was witnessed by more than 800 guests, including about 250 students of various institutes of Delhi and NCR. The Honorable Vice Chancellor of the University, Prof K K Dwivedi along with Principal of Apeejay College of Engineering, Dr Sarbjit Singh welcomed all the guests and participants. After the lamp lighting ceremony, prayers invoking the blessings of the Almighty were chanted by the students. Mr. J P Malhotra, eminent industrialist, was the Guest of Honor. He is presently the President of DLF Industries Association and Vice President of Haryana State Productivity Council and has served as the President of several leading associations in the past such as FICCI. The first day of the fest started with Technological events. There were exciting events such as ROBORACE, DECRYPT, LAN GAMING and E-QUIZ among others. Students from many institutions participated and showed great enthusiasm. The second day of the fest was a mix of Literary and Cultural events. Events like NUKKAD NATAK and SOLO dance had the crowd on their feet. Events like QUIZ and GRAFFITI saw a record number of entries. The highlight of the show was the Fashion parade and the Battle of Bands. This event was sponsored by big names such as Bhargava, Saraswati Music College, Nokia etc. There were mixed emotions of pride and sorrow – pride in the successful completion of the program that showed great team spirit amongst the Apeejayites, the show witnessed more than 3000 combined footfalls over three days and sorrow as the festivities drew to a close even while the audience wanted more. Apeejay Stya University now awaits with eager anticipation for the next mega event in the forthcoming seasons.